Why am I featuring a picture of a residential elevator shaft? 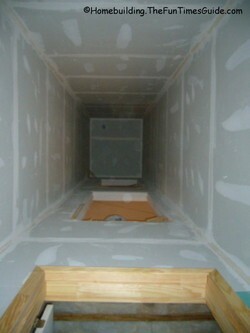 I came across this elevator shaft in a home under construction in the Lost Mountain subdivision in Marietta, GA. The home is crammed with luxurious details and I can’t wait to see the elevator installed at the end of this month. I promise that I’ll tell you all about it when I see it for myself. Update: Here’s the link to the elevator after installation. Residential elevators are a perfect solution for seniors and disabled persons. They offer accessibility in a multi-story home and offer far greater access and home plan options for the handicapped and seniors alike. Developer/Builder Charles Meng of Charles Meng Properties, Inc. has built an exquisite home on an exclusive property on historic Lost Mountain with “a view of Alabama on a clear day”…and we’re 50-60 miles from the Alabama border. I’m not certain about Mr. Meng’s geographical claim, but I’ve taken in the view many times in the past couple of years from where the house now sits and it does not disappoint. Mr. Meng has mentioned to me that he is having a ThyssennKrupp elevator installed. The elevator model type to be installed is The Lev, in my best estimation, and by process of elimination from the ThyssenKrupp website choices of residential elevators. Residential elevators can add 10% to your home value *Based on US national home value average. Are the next “must have’ home amenity- According to a 2004 NAHB Study 91,000 new home buyers in 2003 (and over 94,000 the following year) felt home elevators were an essential inclusion to their home design. A stairway may require as much as 100 square feet of space, while a home elevator can use as little as 24 square feet. You are almost one million times more likely to be injured going up and down your stairs than you are on a home elevator.